Thumbelina Nursery and K.G. School – Where your child is the focus of everything we do! Where your child is the focus of everything we do! As an institution, we are completely focused on providing a stress-free, safe, secure, loving, hygienic and comfortable environment to your children as we truly believe it is only then, that children will be encouraged and motivated to being proactive and confident to learn and interact well with each other and everyone around them. Established in 1974, Thumbelina Nursery & K.G. School is a for-profit private kindergarten school established as a proprietorship concern by Mrs. Perin F. Lalkaka. In recognition of her valuable contribution in the field of kindergarten schooling, Eklavya Education Foundation, in the year 2009, conferred upon Mrs. Perin F. Lalkaka the “Lifetime Achievement” Award. Longer working hours at the office, rise in dual-income-single-child families, rise in nuclear living (no grand-parents around), smaller living spaces are the ground realities facing most young, ambitious and hard-working parents who aspire to provide a better quality of life. Quite unfortunately and unintentionally, the greatest victim of this rat-race, is today’s CHILD – who is virtually left alone to fend for himself while being in the care of an illiterate ayah/neighbour/crèche! The HEADSTART Program, which is a purely optional “non-academic” program, is aimed at supplementing the efforts of time challenged parents by sharing their responsibility in mentoring, nurturing and inculcating in their children, the basics of life and language skills and in creating a general awareness towards the world around them by channelizing their energies through a multitude of fun activities in the company of similar aged children in an organised, loving & safe environment. The Kindergarten Program, offers an age-appropriate curriculum that is preparatory to elementary education. Fine-tuned to cater to children who mostly come from non-English speaking backgrounds, leveraging the “Learning through Play” methodology, it aims at laying in a firm academic foundation and prepares the child to withstand the onslaught of the more regimented elementary education. Admissions to the Kindergarten Program are granted in strict adherence to the government regulations that are in force. If however, a child is observed to be a slow learner, after due deliberation with the child’s parents, he/she may be shifted to a Section which best matches with his/her learning abilities. 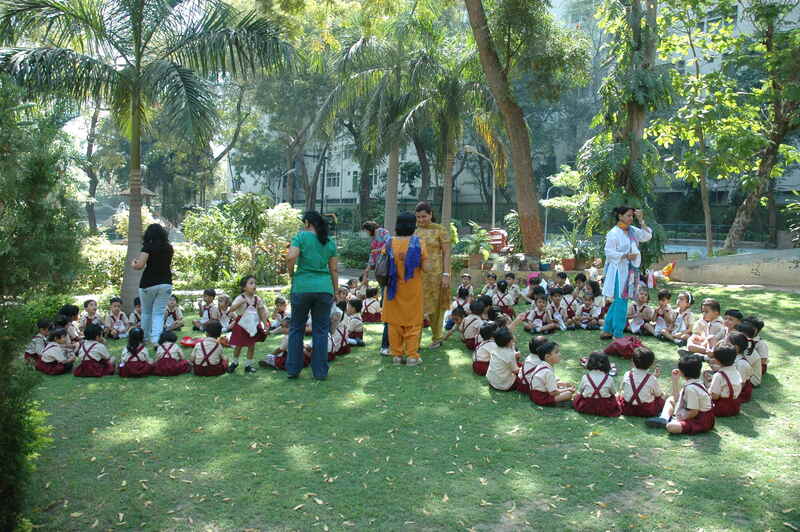 One of the most child-safe and child-centric kindergarten schools in Ahmedabad. See our wide range of child safety initiatives. Promoter-owned independent bungalow premises measuring 9000 sq. ft.
Open children’s play area measuring 5000 sq. ft.
Transport facility available ONLY in certain areas from known and reliable independent transport operators. Learn about how Thumbelina provides a safe learning environment for your children. Thumbelina Nursery & K.G. School prides itself on the calibre of its teaching staff. Learn how you can join our team.